Rick Schwartz takes back control of Property.com - was the domain sold? :DomainGang Rick Schwartz takes back control of Property.com - was the domain sold? Property.com is a domain that Rick Schwartz, the Domain King, has owned for more than a decade. After acquiring the domain for $750,000 dollars on August 1, 2005 (source: NameBio) Rick Schwartz parked Property.com for several years. Eventually, through his “joint ventures” approach, the domain was leased to the owners of Condo.com, a Florida corporation named Mary Street Acquisitions LLC. The company is currently inactive as of 2015. 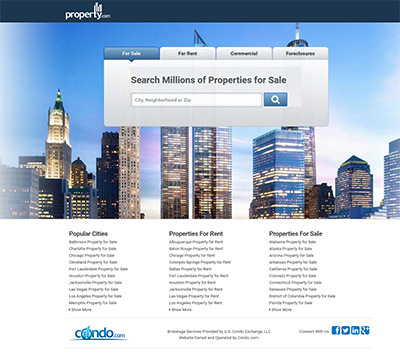 Whether Condo.com changed ownership is unknown, but in 2015 Property.com appears to have been passed to Property Ventures LLC. By October, the branding had reverted to “operated by Condo.com” and on December 7th, the previously private WHOIS was lifted, revealing Rick Schwartz once again as the domain’s owner. Property.com was pointed to DomainKing.com for a couple of days, but it now forwards to Trulia.com, the online property listing marketplace owned by Zillow. Has Rick Schwartz sold Property.com to Trulia/Zillow? If that’s the case, the selling price would be expected to be in the millions of dollars, just like every other large transaction that the Domain King facilitated. Let’s not forget that Zillow paid $3.5 billion dollars to acquire Trulia, so they definitely have the cash to acquire the category-defining domain, Property.com. Take.Vacations : Rick Schwartz does the real thing! I would be interested to know if he actually sold it or if it’s another JV. Maybe even a temporary glitch in whois. If he did sell it, I think it would be easy to assume that he got a minimum of double his investment back. Eric – It’s a 301 redirect to Trulia.com. I would think 10x at a minimum.